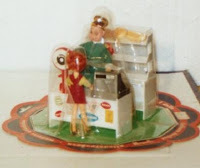 The Hogarin Family Dollhouse is lesser known here in the United States and incredibly hard to find. It was a dollhouse set comparable to Lundby--made up of several dollhouses, a large family (10 figures and a pet). I believe it was distributed in the 70's. I learned about its existence from a rather low key ebay auction. 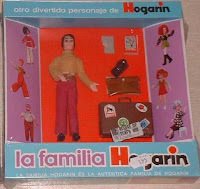 It was an auction for all 10 of the Hogarin family figures plus pet MIB. Well, they sold for a little under $300. This doesn't mean that they are generally worth that much---but they are apparently worth that much to somebody somewhere. 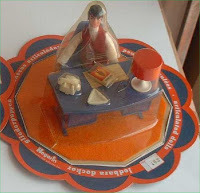 I did some digging on the dollhouse and sets and came across an ad for the toys and several Spanish language websites that were selling the items. There were some nice mod pieces that were distributed with the Hogarin sets. 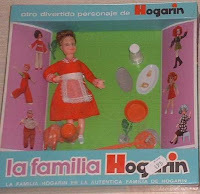 Pictured are some images taken from two ebay auctions selling different versions of the Hogarin dollhouse (note: neither seller knew what they had. The smaller house sold for a little over $100 and I believe the larger house sold for about $35. 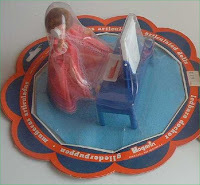 ), some images of individual items sold through a Spanish language site and the toy's advertisement. 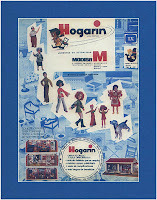 I had the Hogarin House (the biggest one) when I was a child, and I'm really interested in getting it again. Could you please send me any information about it? 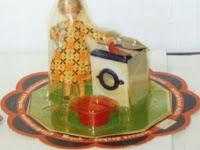 I would like to know if you sell this dollhouse, i am very interested on buy it!! I do not own this dollhouse. I also do not know a seller of it. Keep checking ebay. These Hogarin houses pop up once in while.